I think the flavors of Mexican food are on the top of my list of favorites, and I think Jon would agree. Sometimes, when friends are asking for meal suggestions, I scroll through my blog and notice that the majority of my meals use ingredients such as tomatillos, poblanos, jalapenos, Mexican spices, or cilantro. I buy jalapenos at the produce store and you must get 25 jalapenos in a bag for $2! Pretty soon I should have that many in my garden - I'm growing them and my plants have several peppers each. Yesterday I wanted to use up a bunch of the jalapenos I had, and Jon felt like grilling, so I came up with a menu that would satisfy both of us. I love lots of color on my kabobs. I used red pepper, green pepper, orange pepper, red onion, zucchini, and jalapenos. BE careful, the jalapenos seem to get even hotter after grilling! I'm not really sure if there is a risotto dish in Mexican cooking, but I'm calling this Mexican risotto because of the flavors. I have several recipes for risotto in this blog and this one will definitely remain on the top of the list of my favorites. Add broth, 1 ladle at a time, letting it absorb while stirring constantly. Add peppers after the first ladle. After about 17-25 minutes all of the broth should have been used and the rice should be cooked through. Taste it to make sure it isn't crunchy - my risotto takes 17 minutes sometimes, but 25 minutes on other days. Stir in cheese and serve. I topped mine with some sour cream. This was so creamy, flavorful, and delicious. I think adding the spices to the broth instead of directly to the rice really helped to infuse the flavors into every bite. During the day I made a pot of Mexican Corn and Potato Soup. Here is the link for the first time I made it; this time I added about 6 oz of diced, canned tomatoes and just a bit of the juice and was happy with the addition. YUM!!!!!!!!!!!!!!! I have been waiting for this recipe!! Looks great! 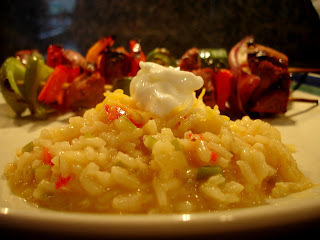 How creative to use mexican flavors in risotto! 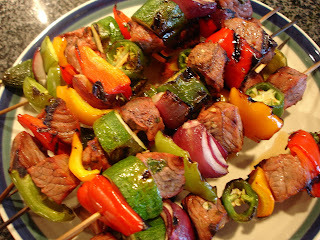 Your kabobs look wonderful and so colorful. Great job! WOW!! That meal looks fabulous. 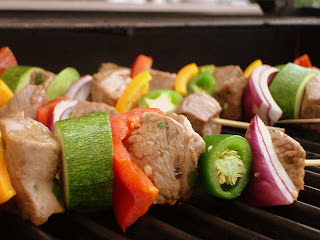 The kabobs made my mouth water! This risotto was AMAZING!!! I used 1 red pepper, 1 small can of corn, and a jalapeno. I actually left out the cheese and sour cream though, bc I felt it was flavorful enough. Had red snapper Veracruz style as a main dish and they went SO well together - http://recipe.aol.com/recipe/red-snapper-veracruz-style/81294. Thanks for the great recipe!! !